In bid to help save money and promote environmental friendly fuel alternatives, Ocean Ambassadors has developed a new model. 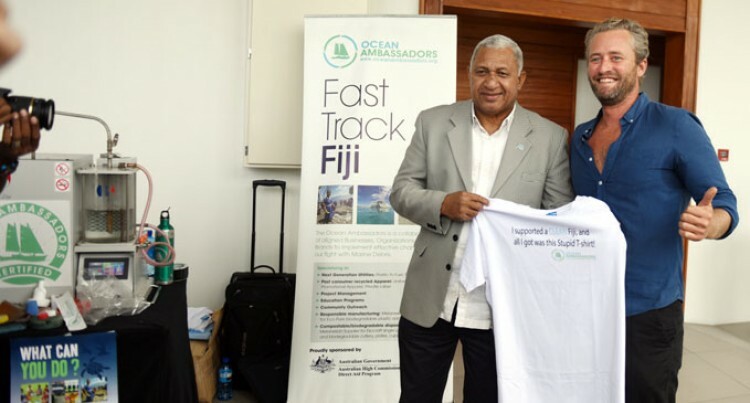 During the Fiji Fuel Retailers Association (FFRA) annual general meeting, the company conducted a set up where the Prime Minister Voreqe Bainimarama trialled the product. Ocean Ambassadors managing director Captain Adrian Midwood said: “We are making a light crude oil which is an environmentally-friendly alternative fuel from the wasted plastic. “We just putting waste plastic over into the kiln, heating it at 420 degrees which gasifies the plastic and it goes over to the other side and the water will just condense, cools up and the oil will just sit on top. “It costs us 1KWh of the electricity for the conversion of one litre of oil and we usually can gain 11KWh of electricity with one litre of oil. He said they are now focussing on setting up the schools as the centralised drop off points and fuel stations as well and looking into buying larger machines. Ocean Ambassadors has been piloting out in the schools all over the country since last year. “We have brought it to the government,” he said.